Hello! My name is Atikah Rais. I'm a Torontonian who's incredibly passionate about henna. I also happen to be a Professional Henna Artist at Mocha Henna who runs around the City of Toronto and GTA providing bridal henna, party henna and private henna services. 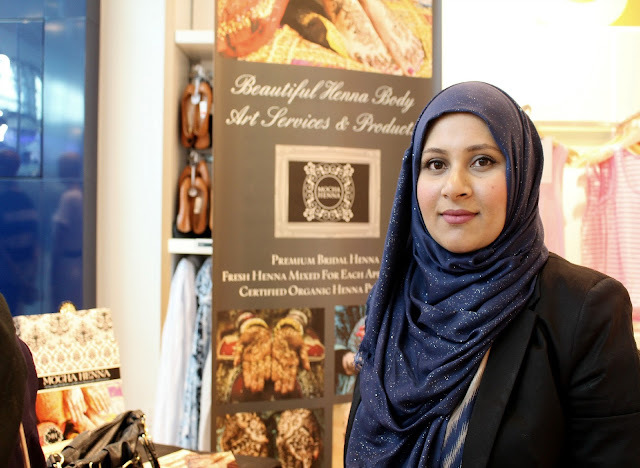 When I'm not busy with appointments, I like to write fresh perspectives on everything henna related. Meet me here for a fun, candid and inspiring place to learn and share the art of henna! As soon as set up was complete, interested onlookers including the staff at the GAP were crowding, asking questions and hovering over my side to watch. 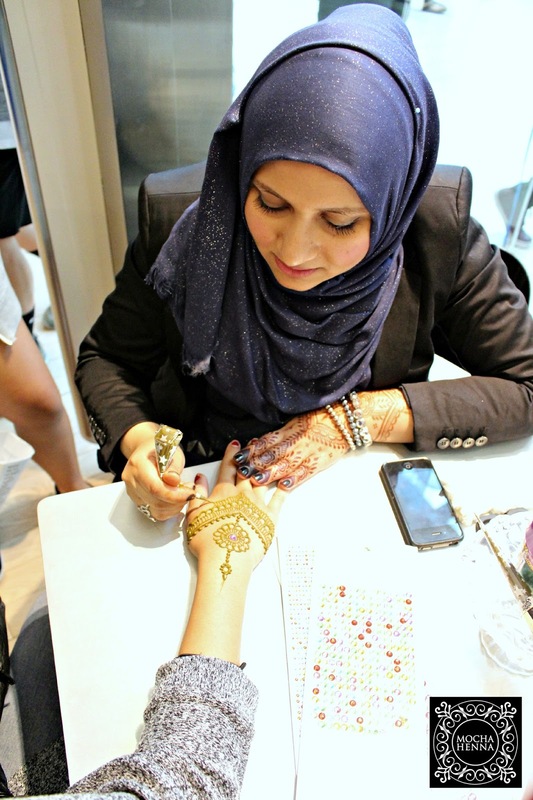 The unfortunate thing about being a henna artist, is that it's near impossible to socialize because we're working non-stop to make you look beautiful! Between the time I started and finished, I rarely got a chance to look up. The event was from 6-8pm but due to the anticipation we started early and continued until closing hours of the store! Thank you to everyone who showed up to the fun filled event! The henna complimented the GAP style very well! For those of you who missed out, here are pictures of the GAP styled by event sponsored by elle.com. Unfortunately, I wasn't able to get additional photos as it was difficult to capture every moment under a busy schedule. 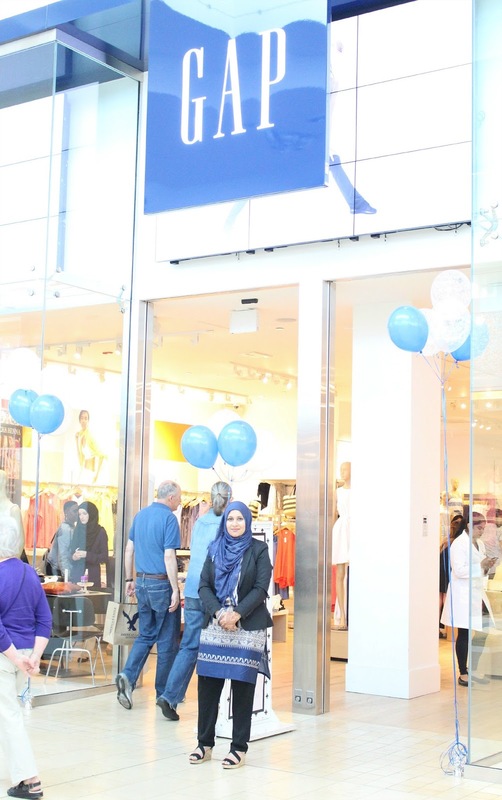 My biggest regret was not being able to take photos of the lovely staff at the GAP as well as my team who helped out tremendously! To see what I'm up to or where I'll be at next, follow me on Instagram and Facebook. Me, just minutes before the rush began. 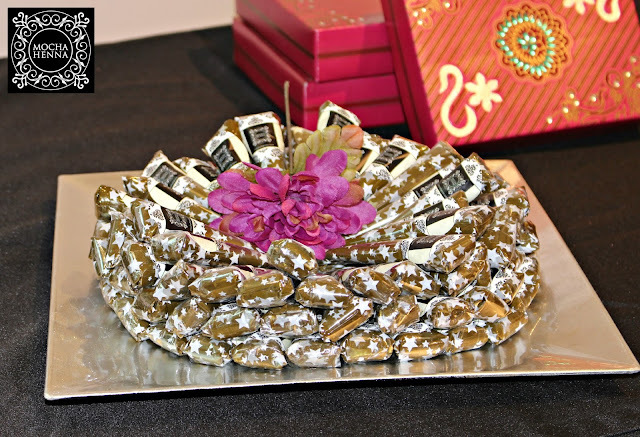 Fresh Mocha Henna cones! Many were picking up and smelling the sweet scent of the henna cones. I was up late the night before, handmixing, rolling and preparing the cones. Hand selfie and table set up. Getting my henna flow on! The sparkle of the gems made the hands all that more prettier! A lovely symmetrical henna design. A cool wavy design across the hand. 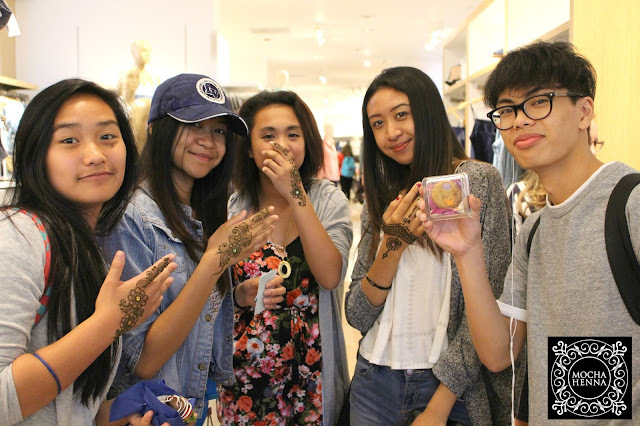 Happy with their henna but even happier to take this group shot! I was so happy to see others just as interested and in love with henna as much as me. A view from outside the store. You can't see me because of the crowd, but I promise I was there! I remember doing a lot of small mandalas with the 'V' pattern. Complimenting her tattoos with a lil' henna. One of the last ones of the evening. An elegant floral strip.